10 Things To Consider When Deciding Your Website Name - Something New Everyday! Registering domain names is one of the most important steps in the website flipping process. A lot hinges on it when it comes to how fast you can sell your website and how good of a price you can get for it. While you may be tempted to go with whatever clever or fancy name that comes to mind when building a website from scratch or looking for one you can purchase, it's worth going over this checklist first to see if the domain name passes the test before registering it. Use your creativity in other aspects of the website but stick to the tried and tested TLDs when registering domain names. 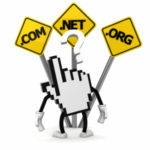 People often assume that a website ends in .com, while .net and .org domains are generally accepted too. This is why potential buyers look no further than these three TLDs when searching for a website to purchase. The only exception may be when you are targeting a specific country or region such as using .com.au for the Australian market. For a few particular sites, numbers and hyphens could be worked into a domain name but in most cases, they may bring down the site's market value. Stay away from these types of domains if possible. When it comes to domain names, long is out and short is in. A long domain may allow you to play around with clever name ideas but if you've been doing this for any length of time, you know that short name domains get sold the fastest and command the highest prices. A domain name of 20 characters or less is ideal. What better way of boosting SEO value than putting a relevant keyword in the domain name. Such a move will help in the search engine rankings and will impress future buyers. If you can fit the exact keyword into the domain name – nothing more, nothing less (i.e. ExactKeyword.com) – then you'll hit a goldmine – not only with the search engines by getting a SEO boost but also with future buyers. If you can't get an exact keyword domain, then revert to rule #4 above and just make sure the keyword is included somehow (i.e. MyExactKeyword.com). A generic domain can catch people's attention more than one referring to a particular market or brand. And understandably, a domain that reaches out to a greater audience would also appeal to more potential buyers. When registering domain names, try to keep them as broad as possible. For example, Cars.com will be more appealing to more buyers than HybridCars.com. Nothing discourages a potential buyer more than having a misspelled domain. While you may get some traffic from people searching with misspellings, you don't want to build a long-term asset on a misspelled domain. Save misspelled domains for your feeder sites or domain portfolio but don't build a website intended to be flipped on them. Websites that contain trademark words may bring in more harm and controversy (which you don't need) than actual traffic and buyer interest (which you do need). And that's not even counting the cease and desist emails that are sure to come or worse yet, trademark infringement lawsuits that could be waiting for you. The more paid ads you see when doing a search for your domain's keyword, the better the chances of your site getting sold. If people are already paying to be on the front page of Google for the keyword in your domain, they'll likely be interested in buying a website that ranks naturally for that keyword and has the keyword in the domain to boot! More and more local businesses are making the leap to the web every day, creating a significant demand for local geographical domains. Grab these local geo domains sooner than later and you'll make a profitable income out of them. Website flipping success starts with registering domain names that pass as many of the tests above. A good domain can be the difference between a small payday and big payday. Get started on the right foot by applying these guidelines when registering domain names for your websites!